Revit 2018 is Out... And... It's Alright. As I mention every year now the "new releases" of Revit aren't always that exciting anymore. This is mostly due to the subscription setup Autodek is implementing. Instead of one massive launch every year they will slowly drip out new features with major releases throughout the year. Personally, I don't mind it. It may not have the April excitement that used to come with every new release of Revit, but it works. Instead of listing them off, I figured I would just give some commentary on a few highlights (in my opinion). The first new feature that caught my eye was an addition to what railings can host to. I find myself modeling a lot of fences, barricades, and miscellaneous elements that need to follow topography. Before this new feature, I had to use Dynamo and adaptive components to make something as simple as a fence that follows topography. Revit 2018 gives you the ability to host railings to topography. I am in the process of really testing the limits of this function, but it is a step in the right direction for me. Other railing enhancements include new stair and post adjustments... Still, creating railings correctly with stairs takes a bit of effort. These two new features I will categorize under "collaboration/coordination". Being able to schedule elements within a group or linked file is a no-brainer. I think everyone reading this blog can see the benefits (or have dealt with the struggles of not having) this feature. I don't know why it took so long, but thanks Autodesk! What Are Your Favorite New or Enhanced Items? 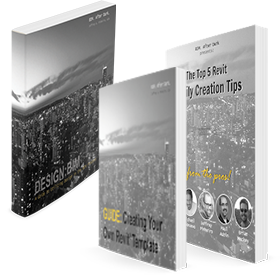 Comment below and let me know what you think of the Revit 2018 release... Here, again, is the list of items. Did you already download 2018 and have been playing around with the new features? Where you wishing to see improvements on the new text tool? Improvements on the depth cueing feature introduced in 2017?